The Joint Statement, signed in Havana by the Cuban and US governments last January 12 changes, for the first time in five decades the political and antagonist nature of the bilateral migration relationship. This document is a step towards the normalization of relations on this issue but to truly achieve it, the US Congress must repeal the Cuban Adjustment Act. However, this agreement has a great impact in the quest for a regular, safe and orderly migration. This signing took place on the day that marked the fourth anniversary of the new Cuban migration law that has allowed over 670 thousand Cubans to make 1.75 million trips abroad. Which are the main issues of this new migration agreement¨? The United States repealed the ¨Wet foot, dry foot¨ policy and the Cuban Medical Professional Parole Program, this last one meant for Cuban health professionals working in third countries. The US made a commitment to issue a minimum of 20 thousand visas a year for Cubans to migrate to the United States, not including this amount those issued for tourism, or cultural, scientific and other exchanges. From the coming into force of this agreement all Cubans caught trying to enter the US or staying there illegally will be removed from US soil and deported back to Cuba. In the 1984 migration agreement, Cuba agreed to gradually receive the 2,746 Cuban citizens that left the country during the 1980´s Mariel boatlift that were deemed unfit to reside in the United States. Most of them have already traveled to Cuba since that very decade, and only some 700 are in the US. Through the Joint Statement, Cuba agreed to replace the names of those declared non eligible to stay in the United States in the 1980s and that had died, are missing or have health issues, for others that do not qualify to stay in US soil and from the same group of the so-called ¨marielitos¨ till the completion of the 2,746 figure. What happens now that the ¨Wet foot, dry foot¨ policy is gone? If a Cuban arrives in the US without a valid visa, he/she will not be admitted automatically in the US as it was happening, but he/she will be detained and removed to Cuba. And what does the Cuban Medical Professional Parole Program imply? The Cuban health professionals will receive the same migratory treatment that those from the rest of the world, as the law establish and will not be received automatically. The United States publicly acknowledges the worth of the Cuban universal care and stop the brain drain of health professionals, at least this way. What benefits will the document signed bring? 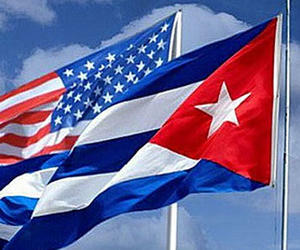 It contributes to the safety of both countries and to the Cuban citizen´s. It removes an incentive for irregular and unsafe migration. It is a blow to human trafficking. Many smugglers have benefited from the irregular traveling, especially through the Central American corridor, and on many occasions have subjected our citizens to atrocities: extortion, mistreatment, abuse of women and even murder. Does this agreement override those from the past? Absolutely no. The prior agreements remain valid, those of December 14, 1984; September 9, 1994; and May 2, 1995, after the Mariel boatlift and the Crisis of the rafters, respectively. In every case, as in this one, they ratify that both parts commit to work on a ¨legal, safe and orderly¨ migration. Does this agreement repel the Cuban Adjustment Act? President Obama cannot repeal the Cuban Adjustment Act, which is a federal legislation issued on November 2, 1966. Only the US Congress has the ability to repeal it. It states that only the US General Attorney has the discretionary power to adjust the migratory status of Cubans that might be in an irregular situation. It doesn’t say that is mandatory, but that the Department of Justice discretionary decides whether accepts a Cuban in its territory or removes it. The new agreement reduces considerably the number of Cubans that have recourse to this law after one year and one day in US soil. If a Cuban travels to the US under a tourist, or any other kind of, visa, and decides to stay there illegally, to apply to the Cuban Adjustment Act, what will happen? 8.- What will happen to Cubans deported from the US? They will be received by Cuban authorities in ports or airports; will have to go through a brief medical quarantine at a medical institution, provided with clothes, shoes and food, as it has happened since 1995, and then taken to their homes for them to get back with their lives normally. Only those that have pending issues with the law, hijacked a plane or boat or killed somebody on their way to migrate will have to stand trial.